Amitabh Bachchan, who has previously sung iconic tracks for films such as Silsila, Baghban, Nishabd and Shamitabh, has sung a lullaby for Aamir Khan's Thugs Of Hindostan, which was required to portray the depth of the characters played by Big B (Khudabaksh) and Zafira (played by Fatima Sana Shaikh). As Thugs Of Hindostan's release date is nearing, speaking to news agency IANS, Big B added that he has asked Aditya Chopra (head of Yash Raj Films, which is producing the ambitious project), to include the lullaby in Thugs Of Hindostan's official album. "The lyrics are beautiful and the composition highlights the emotional journey of these two characters who have an incredible father-daughter relationship. I have been telling Aditya (Chopra) to put this in the Thugs Of Hindostan album. I'm sure he will do it because it's turned out to be a beautiful song," IANS quoted Big B as saying in a statement. 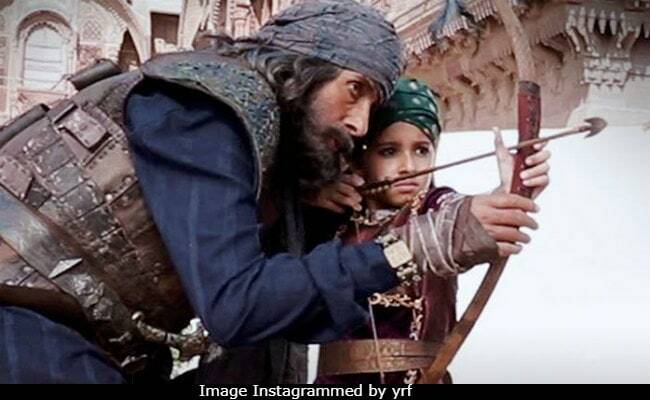 In Thugs Of Hindostan, Amitabh Bachchan plays the Khudabaksh - a thug who rules the seas and is determined to bring the East India Company down - and Zafira is a skilled archer, who is his second in command. The trailer has glimpses of the bond that Khudabaksh shares with Zafira, which is exactly the flavour of the lullaby: "The song tells you the depth of the bond that Zafira and Khudabaksh share. I was most excited about singing this lullaby because it is not every day that you get to sing one," Big B added. The unreleased song from Thugs Of Hindostan has been composed by the musician duo Ajay-Atul while credits for the song's lyrics go to Amitabh Bhattacharya. IANS reports that according to a source, the lullaby will depict how Khudabaksh mentored Zafira since she was a child. "He wanted to show the deep trust, the love and the respect that Zafira has for Khudabaksh and decided to add a moment of vulnerability between the two. Khudabaksh will be seen protecting Zafira at every step and they are inseparable souls," said the source. Meanwhile, Amitabh Bachchan was said to be super excited about his new role in Thugs Of Hindostan: "Mr Bachchan was so kicked about singing this lullaby that he decided to record it himself and that too at his home! The initial idea was to make a short lullaby but Mr Bachchan went a step further and converted it into a song. He is insisting that Aditya (Chopra) puts it into the album," the source added. Thugs Of Hindostan has so far released songs such as Vashmalle, Suraiyya and Manzoor-E-Khuda. Directed by Vijay Krishna Acharya, Thugs Of Hindostan also stars Aamir Khan (who plays a conman named Firangi Mullah) and Katrina Kaif (who has been cast as famous dancer Suraiyya). Thugs Of Hindostan is slated to hit screens on November 8.